Becoming a great speaker takes a lot of practice. Practicing with people who can give you candid feedback and help you make positive changes to your delivery. On June 18th I was at the Brian Adams’s Speaker’s Bootcamp where I gave a speech on which I received invaluable feedback. 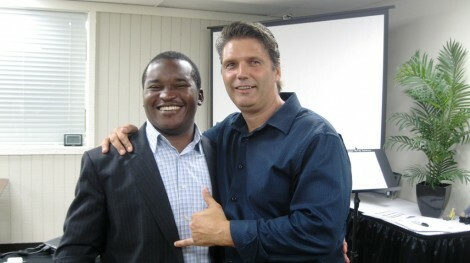 The speaker’s bootcamp was the second of such organized by Brian Adams in the few months that I have known him. I mention Brian Adams in a previous article on this website. Spending time with Brian is always a great learning experience as he has practically devoted his life to serving people through speaking. The most powerful spot on stage is in the audience’s heart. This is one statement Brian made that really drew my attention. Good public speakers know how to use the stage to enhance their message. The use of stage is often learned in sync with the use of body and gestures to communicate the message. However, sometimes a speaker may have limited movements due to a podium with a microphone or a physical constraint. In that case, Brian’s statement will be more true than ever. People don’t really care (most of the time) about where you stand or how you stand when you speak. They care about connecting with you and if you find that spot in their hearts, you would have found the perfect spot on stage. We do business with people we know, like and trust. In the information age, your first competitor is your target client because everything you sell can be created and sold by someone else. In order to sell, you have to develop a personal and business brand that is easily identifiable. Develop a likable personality or business image (your image is part of your brand). Be trustworthy, always deliver on your promises or better yet, exceed your clients’ expectations. Your business will grow when you build a strong brand, develop a likable personality, and deliver on all your promises. The best way to grow your business is through referral. Every time you have a satisfied client, ask for a referral to someone else you can make happy by providing your service. It is an established fact that dissatisfied clients tell more people than happy clients do. But happy clients would tell more people about their good experience if they are asked to. If you get a good feedback from someone you served, ask for a referral. Brian and Victor Broski (co-host for the event) introduced the Orange County Speakers University experience which is a 12 weeks program designed to help speakers define a message and refine it. The program will be concluded with a speaker showcase night where speakers will invite their friends and family for a 20 minutes presentation that will represent the culmination of the learning experience. Speaking is an essential skill to become a person of influence and get ahead in life. Contact Brian Adams today 7143156285 for more information about the Orange County Speakers University experience. Which one of the lessons above have your heard before, and which one is your favorite?